You are now my favorite vegetable. I feel you are often misunderstood and hated by those who have not grown to love you like I do. I’m sorry that Nathan doesn’t like you anymore because I insisted we have you for dinner too many times in a row. He no longer lets me choose vegetables when we are at the grocery store because of my obsession with you. I think he’s jealous. Okay. I know it’s stupid to write a love letter to a vegetable. There is no need to point that out. However, I’ve never really liked vegetables that much. So, imagine my surprise when reading through a few blogs one day, I saw Brussels sprouts and actually thought they looked good. I asked Nathan to help me make some and I’ve been in love ever since. This is not your grandma’s brussels sprouts. I’m not even sure I had ever tried a Brussels sprout in my life. But, I knew I hated them. That’s just how I do things — I hate food for no reason sometimes and I’m okay with that. I often make these for our guests so I can convert them to be a Brussels sprouts lover like me. Cabbage — Not the slimy boiled kind. Asparagus — Fresh, not canned. Heat oven to 400 degrees or get your grill really hot! You can slice the Brussels Sprouts in half or leave them whole. If they are big, I cut them in half. If they seem pretty small, I leave them whole. The picture above was a mix of big and little ones — so I did a mixture. Coat Brussels Sprouts with olive oil. Add salt and pepper to taste. I treat them like French fries and salt them pretty good. Add a splash of balsamic vinegar and mix it all around. I like to let them set for a few minutes. Grill method — Skewer the Brussels Sprouts and place on the grill until they start to burn a little bit. Turn them a couple of times to ensure that all sides get some direct heat. Oven method — Lay Brussels Sprouts out on a cookie sheet and place in 400-degree oven until. Turn them a few times to ensure even cooking. Let them cook until browned a bit in places. I like to let mine over-cook a little bit. Note: If Brussels Sprouts are really big, I put them in a covered bowl and heat them in the microwave for two minutes before I put them in the oven or on the grill. 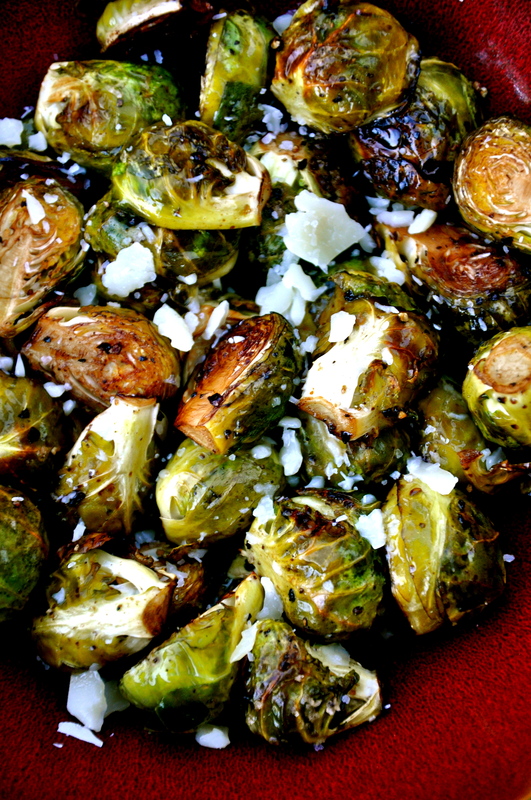 Salt, sprinkle with parmesan cheese if you dare, and go write your love letter to Brussels Sprouts. Yes this is normal to have a change in what you like. They say your taste changes throught the years. I know mine sure has . So I guess your growing up.